The historian and broadcaster, Dan Snow has returned to Dover from Calais, with about 25 stranded travellers he rescued using three motorboats. His rescue mission used rigid inflatable boats, known as ‘ribs’. He has crossed the Channel to help those affected by flight restrictions, but he said the French police had ordered him not to return. TV presenter Dan Snow’s mission to bring back home people stranded in France has been halted by officials. Stranded in Europe? Can get to Calais? Oltre a suppliche per un passaggio, fra i tweet degli amanti del design in fuga si trovano anche casi di inaspettata generosità: preoccupato per la sorte dei suoi compatrioti, Dan Snow, giovane scrittore e presentatore della Bbc, ha aperto l’account calaisrescue. Domenica, promette, sarà a Calais con una miniflotta di cinque barche e fino al tramonto farà la spola sulla Manica con il porto di Dover. Ma come raggiungere il porto francese sulla Manica resta un problema aperto. 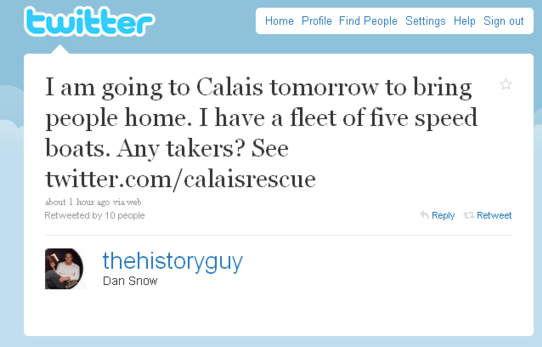 In addition to pleas for a passage between the tweets of design lovers on the run, are also cases of unexpected generosity: concerned about the fate of his compatriots, Dan Snow, a young writer and presenter of the BBC, has opened the account calaisrescue. On Sunday, he promises, a mini fleet of five boats will be at Calais and there will be an evening commute across the Channel to the port of Dover. But how to reach the French port on the Channel remains an open question. Posted in Latest Dan News | Comments Off on Stranded in Europe? Can get to Calais?